Stand has weighted base for stability, with a total weight of only 10kg! The pedestal sign holder floor stand, like steel poster displays, make advertising around your business simple. The dual-sided display maximises floor space by having a small footprint without compromising on on your outreach to customers as you still advertise in multiple directions without having to use a secondary display! The stand is 1420mm tall as well, offering a highly visible display that is sure to draw the attention of passersby. 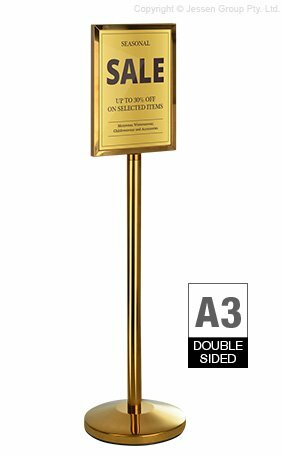 This pedestal sign holder floor stand displays an A3 (297 x 420mm) poster in portrait orientation. The lobby poster stand uses a slide-in design to allow posters to be switched quickly without additional tools necessary. Clear acrylic panels that are 2mm thick help protect the posters on each side from getting dirty during display, and themselves are easily cleaned with standard solutions to maintain a professional appearance. he lightweight display is easily put into position as it weighs only 10kg. The weighted base helps to ensure the stand doesn't tip over easily if jostled, ideal for retail and other fast paced environments. The stand is made of stainless steel to offer durability, with a gold finish that provides an upscale look that looks great anywhere. This display despatches same day when in stock to anywhere in Australia when ordered by 2pm EST from Slimline Warehouse!